The British climbing community is reeling from news of the deaths of Andy Nisbet and Steve Perry on Ben Hope on February 5. All climbing accidents are tragic, but this one cuts deep to the core of who we are and what we do. 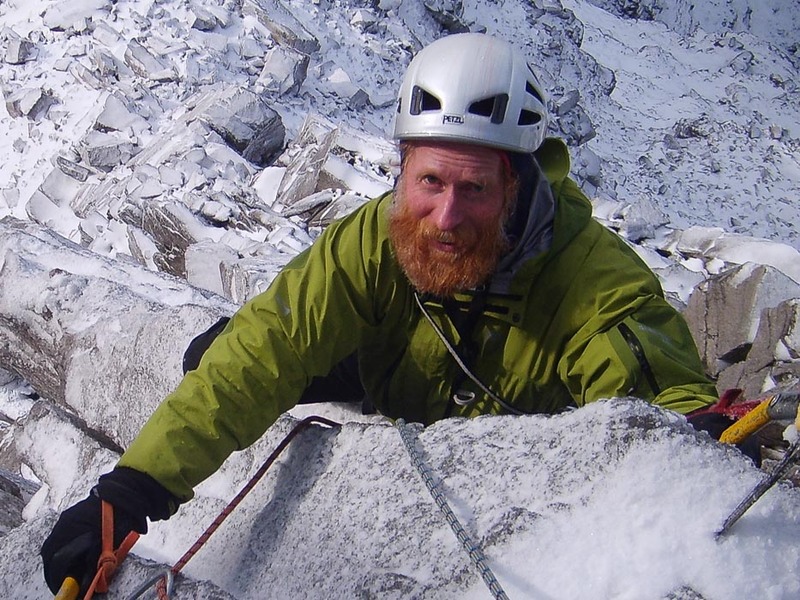 Andy Nisbet was the undisputed figurehead for Scottish winter climbing and his sudden passing is almost impossible to comprehend. This is a difficult piece for me to write. My mind is a mixture of whirling thoughts and emotions and I’m still coming to terms with the immense contribution that Andy made to our sport. He impacted us all, as a pioneer, documenter and faithful friend. It is no exaggeration to say, that without Andy Nisbet, Scottish winter climbing would not have the breadth, vibrance, variety and energy that it has today. Let me start with my own personal journey. Despite being based in the South of England I became captivated by Scottish winter climbing when I was a student. Our university Club booked the CIC Hut for a week each Easter holiday and I’d been fortunate enough to climb a few of the Grade V classics on the Ben. Rather kindly, the SMC sent us a copy of their Journal, and I can remember very clearly the excitement of pulling the distinctive sky blue-covered volume from its brown envelope one sunny day in the autumn of 1980. The lead article was by Andy about the first winter ascent of The Link on The Black Pinnacle on Lochnagar with John Anderson. Andy’s writing captivated me – I thought I knew a little bit about Scottish winter climbing, but the intricacies of difficult mixed climbing on one the most challenging cliffs in the Cairngorms was like entering a different world. The technical difficulties were clear (The Link was one of Scotland’s first Grade VIIs), but above all, it was the adventure and pioneering spirit that shone through. I read and re-read that article, and resolved that one day I would climb The Link. A succession of aborted trips made me realise that to learn the Scottish winter craft, I needed to live closer to the Highlands. This led to a deliberate choice of career that I knew would eventually lead me to Scotland. Ten years after reading Andy’s article, I moved to Aberdeen. Lochnagar was now my local cliff and six years later I climbed The Link with Chris Cartwright. It was the one of my happiest ever climbing days, but more significantly, Andy had set me on a course that was to define my life. When a complete history of Scottish mountaineering is written, several names will stand head and shoulders above the rest. The great legendary figures of the past such as Raeburn, Marshall, Smith and Patey will be linked with one contemporary climber – Andy Nisbet. Andy’s winter record is without comparison – by the mid 1990s he had made first ascents of over a quarter of the 600 or so routes graded V or over, with a distinct bias towards the higher grades. In total, Andy is thought to have climbed over one thousand new Scottish winter routes. One has to look to the records of Fred Beckey in North America, or Patrick Gabarrou in the Alps to find climbers whose influence has been as long-lasting and profound. Andy was born in 1953 in Aberdeen. His parents had a keen interest in the hills and took him hillwalking from an early age. In his teenage years he started to collect Munros, and he was given a rope for his eighteenth birthday in order to climb the Inaccessible Pinnacle. A year later he completed his last Munro in the company of fellow school friends Alfie Robertson and Kenny McLean. In 1971 Andy started studying biochemistry at Aberdeen University. He joined The Lairig Club (AUMC) and began regular rock climbing on the local sea cliffs. The following summer he attended a Glenmore Lodge rock climbing course with Alfie Robertson. The pair were so enthused that they signed up for a winter course in the New Year. Keen to gain some experience before their course, they visited Lochnagar on Christmas Eve and climbed Raeburn’s Gully – their first winter route. The seed had been sown and that winter they climbed on Lochnagar every weekend and by the end of the season they were climbing Grade IV. The 1974/75 winter was poor, but Andy continued to work his way through the Lochnagar classics including Douglas-Gibson Gully, his first Grade V. He also recorded his first new route, Yoo Hoo Buttress on Broad Cairn Bluffs, a short Grade III buttress climb. The following season Andy and Alfie got really stuck into the winter game making ascents of several Grade Vs such as South Post Direct on Meagaidh and Gargoyle Direct on Lochnagar. The harder routes however, only succumbed after long campaigns, experience that was to stand Andy in good stead later in his career. Eagle Ridge (VI,6) for example, the Lochnagar test-piece of the day, was only climbed during a 12-hour push on their third attempt. Andy told me that they wore their woollen breeches over their waterproofs to get extra adhesion on the icy rock. In 1977 Andy came of age as a winter climber with the first winter ascent of Dagger on Creagan a’Choire Etchachan, his first Grade V new route. Andy’s breakthrough into the big time came the following December when he made the first winter ascent of Vertigo Wall (VII,7) on Creag an Dubh Loch with Alfie. This intimidating and very steep Patey VS, high on Central Gully Wall, was heralded as one of the last great problems of the time. They only climbed two pitches the first day and spent a miserable 18-hour bivouac on a small ledge at the end of the traverse. They continued next day using several aid points, and finished after midnight just as their torches ran out, and arrived back at the car at 6am next morning. “Vertigo Wall was the hardest mixed route in Scotland at the time,” comments Cairngorms climber and historian Greg Strange. “I doubt if anyone else could have done it in any better style. Andy was already recognised as a very determined and bold winter climber.” Greg’s comments ring true. The big serious Ben Nevis Thin Face routes such as Albatross VII,6 and Pointless VII,6 were not climbed until later that winter, and The Shield Direct VII,7, which in many ways is similar in style and difficulty to Vertigo Wall, was not climbed until 1979. The winter of 1980 saw a race between rival Edinburgh and Aberdeen teams to pick the major Cairngorm plums. In January, conditions on Creag an Dubh Loch were exceptionally icy. The Edinburgh team of Rab Anderson and Rob Milne were there first, and climbed the long-sought after White Elephant (VII,6) on the Central Slabs. They were later overheard in a pub talking about the exceptional amount of ice on Goliath. Word got back to Andy who climbed the route four days later with Neil Morrison. It didn’t go all Andy’s way that winter however, as later in the season he was beaten to the prestigious first ascent of The Citadel (VII,8) on the Shelter Stone by Murray Hamilton and Kenny Spence, when he crashed his car leaving Aberdeen. Hard mixed climbing in the early 1980s was a rather different game to now. The crux pitches on the big Shelter Stone routes for example, were originally ascended on powder-covered rock wearing thin gloves. In 1981, Andy began to experiment with mixed climbing techniques on Carn Etchachan above Loch Avon. It was a poor winter with little snow and ice, but the deep cracks of the Northern Cairngorm granite proved ideal for jamming ice axe picks. It was another three years however, before the term ‘torquing’ was coined for this technique. “Colin MacLean made a winter attempt on The Outlands on the Tough-Brown Face with Arthur Paul”, Andy explained, “and he came back raving about laybacking up cracks by torquing their axes. People had used axes in cracks before, but this was the first time it had been done move after move. Colin was so excited that he persuaded me to go up and try Nymph (VII,8) the next weekend.” The route turned out to be an eye-opener, with MacLean leading the crux pitch a 30m vertical corner entirely on torques. The technique had been proven and a whole new spectrum of difficulty was now open. Whilst the West Coast climbers gnashed their teeth that one of their best winter lines had been poached by Aberdonians, Nisbet and MacLean were already working at their next project – a winter ascent of The Needle (VIII,8) on the Shelter Stone. “It took two weeks of continuous effort,” Andy recalled. “We worked out the best winter line, waited on weather then climbed the first two pitches as a recce to the winter start. We then sat out more bad weather before climbing the route with a bivouac in mid February.” Even though it was climbed nearly thirty-five years ago, The Needle is still one of the most sought after high standard winter routes in Scotland and has only seen a dozen or so repeats. Back in the mid-1980s it was probably the most difficult mixed climb in the world. No Siesta on the Grandes Jorasses (a similar breakthrough for the Alps at the time) was not climbed until 1986. Later that year, Andy started working at Glenmore Lodge where he met Andy Cunningham. Although Cunningham was new to high standard mixed climbing, he was quick to learn, and the two Andys formed one of the most effective partnerships in the history of Scottish mountaineering. Over the next three winters they added over 25 outstanding Grade V routes all over the Cairngorms and Northern Highlands. These included Salmon Leap (V,5) on Liathach, the bold Vishnu (VII,6) on the East Wall of Coire Mhic Fhearchair and the demanding Postern Direct (VII,8) on the Shelter Stone. Over the past 25 years, Andy became the most prolific explorer of the Northern and Western Highlands. Working with Martin Moran taking winter climbing courses from a base in Loch Carron in the 1990s provided a superb opportunity for investigating some of the less well-known corners of the Highlands. The transition from chasing the hardest ascents to pure exploration was a natural progression and resulted in hundreds of brilliant new routes with strong partners such as Jonathan Preston, Dave McGimpsey, Sandy Allan and latterly Steve Perry. We climbed together occasionally – I was always struck at how efficiently Andy moved in the mountains. His ice technique was extremely good and his footwork was exceptional. He particularly enjoyed padding up blank slabs. Andy and I corresponded frequently, checking details about routes and corroborating first ascent details. I would often come home to find three or four messages from Andy in my inbox. He was meticulous, patient and very polite with whoever contacted him, regardless of the route they had climbed. This friendliness extended to the hill where Andy was warm, humorous and always intensely interested in what others were up to. He was an inspirational President of the SMC from 2010 to 2012 and was awarded the prestigious Scottish Award for Excellence in Mountain Culture in 2014. His quiet manner, bushy red beard, unbounded enthusiasm and unfailing optimism became synonymous with Scottish mountaineering. He had hundreds of social media friends, and many people felt they knew him without ever actually meeting. Andy’s influence was universally positive and far reaching. The loss of Andy Nisbet leaves a gaping hole that will be impossible to fill. It is only in his passing that we realise how much we have lost. He invented the mixed climbing game that we play today and ensured it was accessible to all by accurately sharing information via the Journal and guidebooks. Andy was our leader, our inspiration, and our mentor. Scottish winter climbing will never be quite the same again. This entry was posted in Commentary and tagged Andy Nisbet. Bookmark the permalink. A lovely in-depth tribute to Andy. Just a small point: you say The Needle was almost twenty-five years ago, should be thirty-five years surely. Not that I winter climb, but it’s great to get things in perspective, in terms of relative difficulty of routes in Scotland compared to elsewhere. Very informative, and full of warmth and humility and a deep knowledge and understanding of Andy’s nature and personality too. Thanks for sharing. Thanks Gary. It should be 35 years – now corrected! A great loss to our sport and adventurous way of life, travelling through the night, I did many of Andy’s routes in the 80’s to the present day with much joy, blood sweat and fear! Hi Simon. A fine respectful comment on Andy, the sense of loss palpable throughout. Andy was undoubtedly a master of the white stuff and no doubt this is how he will be remembered. I climbed a fair bit with this enigma of whiteout and freezing cold in the eighties. I was never attracted to winter climbing. My memories of being with Andy in the mountains is purely on rock. He underplayed his ability on rock but we did some great routes together. On trips to North Wales we did White Slab, Vember, West Buttress Eliminate at Cloggy, Left Wall, Cemetery Gates down in the Valley, and The Grooves up at Cyrn Las. We did an early ascent of Cougar at the Dubh Loch. I remember him leading the first ascent of Atlantic Crack at Reiff; a magnificent sustained E3 with the crux at the top. And there was a lot more. I haven’t seen him for a long time but have followed his career astounded by his drive to be out there and keep playing the game. Thanks Brian. A few folk have pointed out Andy’s incredible Scottish rock climbing legacy – probably well over a thousand new summer routes!